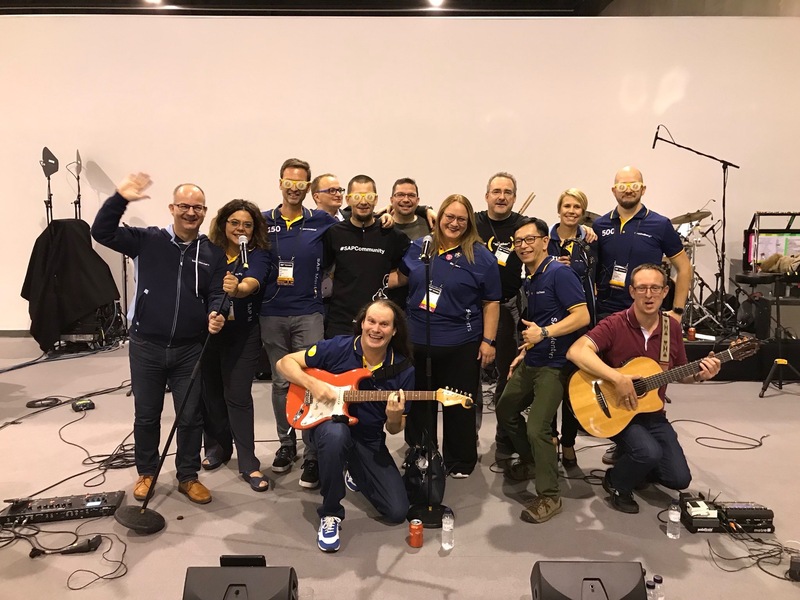 TechEd 2018 Barcelona – where is the SAP Jam Band? It’s new week, I’m back home after my 4th SAP TechEd in Barcelona. 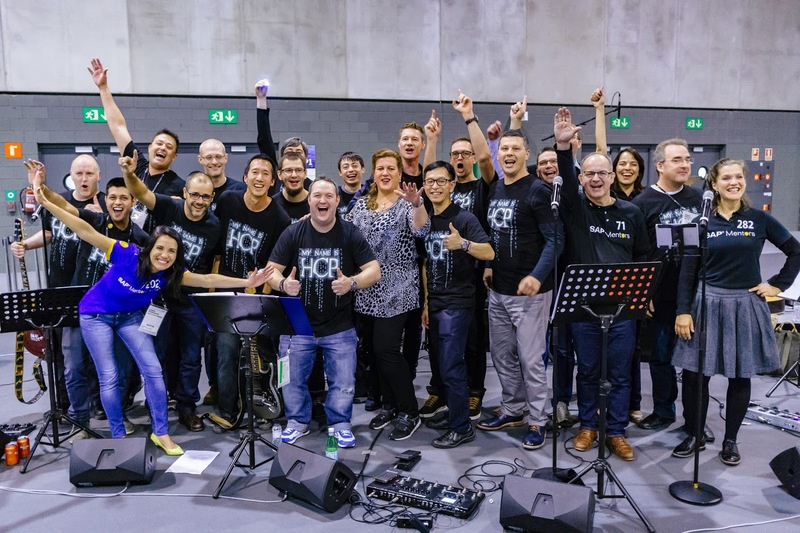 There were already many tweets and some blogs about this very nice event, described from the technical and knowledge perspective, that’s why I want to focus on community part here, precising about SAP Jam Band. When you’re are for the first time on such event and you’re there alone, then the whole event is overwhelming people, at least it was like this for me when I’ve joined TechEd for the first time in 2015. Luckily for me I was in contact with Ivan Femia before attending to TechEd as I did small change to abap2xlsx project at that time and being on a TechEd was a perfect opportunity to meet him in person in Barcelona. We’ve meet on first day, just before the SAP Mentors Jam Band (I think it was the name at the time) had its performance. Ivan was inviting and convincing people to dance and support the Band and although he was not playing any instrument or singing ( I think beside the last song when all SAP Mentors went on stage) he was the part of the Band. At this day I said to myself, If I’ll be joining TechEd in future, I want to be part of the Band if there will be space for me. The year after in 2016 I’ve been again on TechEd in Barcelona. This time I was listening to the “Twitter” radio to hear news about the Band and once a tweet about collecting people to the band appeared, I signed myself to join the Band. At that year it was called HCP Jam Band. It was bloody funny, we’ve practice on Monday evening, then on Tuesday morning we’ve played two songs at the end of the keynote that was done by Bjoern Goerke. Even Bjoern himself join the band not only on the keynote, but also in the Tuesday evening during networking part. The Band was a bit smaller than before, as it depends always who joins TechEd. This time I was mixing a bit roles of backup and lead singer plus guitar player but only for the song “Wonderwall” from Oasis. Even that I’ve made some mistakes playing it, I would do it again with pleasure. SAP Jam Band had a great audience that year as well. So I hoped to join the Band in next years as well. But in 2018 I haven’t got any information about the Band. At the beginning I was not planning to be in Barcelona but around one and a half month before I’ve got a green light to join TechEd again. The Band would not play this year. After a while of thinking about this I’ve asked Jason Cao if he’s joining TechEd in Barcelona this year as well, and if the Band will be playing. Unfortunately he told me, that he will not be on place and from the news he had at the time, the Band will also not play. That was a bit sad for me. And this sadness came back a bit during the networking on Tuesday evening. The Band was for me a part of the event, the part that was built by community on with huge support from SAP. I don’t know if I’ll join TechEd next year, but if I would, then it would be nice to see & listen to the Band again, even if I wouldn’t be part of it. So will there be SAP Jam Band in 2019? Would you join the Band to have fun and spread the only universal language in the world? Great recap and great pictures! While I haven’t attended SAP TechEd Barcelona, I have many great memories of the Jam Band in Las Vegas; one year some did Elvis impersonations; another year Gretchen Lindquist (who is also a professional singer) sang “Walking on Sunshine” and last year, I attended a Juergen Butsmann session on embedded analytics at 6:30 pm and then an hour later he is the drummer for the Jam Band! Another year Jocelyn Dart & team sang Johnny B. Good (Back to the Future) theme. Yeah, SAP Fiori Jam Band was in Las Vegas with a great lead guitar by Matt Harding ! Was a pleasure to meet him in Barcelona in 2016! Its certainly not due to your lack musicianship that I didn’t send you (or anyone else for that matter) an invitation email. The simple reason is that although we had the budget this year, neither myself nor anyone else had the time to do the organisation and planning. Building the data model itself wasn’t too difficult, but ensuring that all the data was clean and consistent took longer than expected. Thanks Chris for explanation! Maybe next year we can help with the planning and organization? Anyone that would like to be involved and taking a direct role in organization please do reach out to me, we’d like to be able to continue to bring this to the event if there are folks who can spare the time to help make it happen.